Pension Obligation Bonds: Borrowing Our Way to Prosperity? 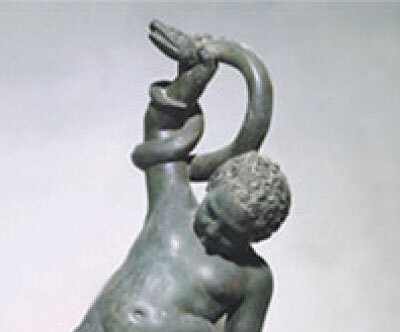 The infant Hercules strangled the snakes sent to kill him, but he would have been terrified of pension obligation bonds. Michigan’s children will be, too. Imagine a world where you can earn generous retirement health care benefits while politicians pass the unaffordable costs on to your neighbors' kids and grandkids. Further imagine a system where elected officials, who maintain a symbiotic relationship with your employees union, attempt to hard-wire this intergenerational transfer into law so that your benefits won't be reduced as the costs climb. Welcome to the world of government employment. Bills in the Michigan Legislature would allow local governments to sell "pension obligation bonds" to help pay the retirement health care benefits of local government employees — and make the risks for future taxpayers even worse. One can only hope that state and local policymakers will refrain from passing on this rashly incurred debt to future generations. To understand the irresponsibility of pension obligation bonds, remember that an employee's retirement benefits should already be "paid-up" when he or she retires. In other words, governments should be setting aside enough money during an employee's career so that the cost of his or her total lifetime retirement benefits has been saved up by the time the employee retires. But where is the political incentive to properly prefund retiree medical liabilities when policymakers can simply defer paying the costs until an employee retires? After all, a pay-as-you-go approach allows local officials to overpromise benefits while creating a mirage of manageable costs. If the real costs had to be paid upfront, taxpayers would revolt. Instead, the costs are thrust upon the next generation of taxpayers, many of whom are too young to vote. The result is an unsustainable Ponzi scheme. But what happens when you have deferred the maximum cost permitted by law and the result is still deemed unaffordable? Rather than reduce benefits or cut other spending, legislators propose to float a bond, known as a "pension obligation bond," to finance these unaffordable benefits. The theory is to borrow monies at a relatively low interest rate — for example, 4 percent — and invest the proceeds within a pension or health care trust fund to earn an assumed high rate of return, such as 8 percent. Whatever the theoretical merits of this financial arbitrage, the practical reality is that it simply creates more risk and more debt for the current and next generation of taxpayers. To see the problem, ask yourself this question: Would you borrow on the equity of your home and invest the money in capital markets, hoping for an 8 percent annual return? If this investment proposition gives you pause — and it should — you understand the fundamental risks associated with pension obligation bonds. According to a May 1, 2008, Bloomberg.com story, former investment bank chairman and New Jersey Gov. Jon Corzine called these bonds: "The dumbest idea I ever heard. It's speculating the way I would have speculated in my bond position at Goldman Sachs." He added: "It's lousy public policy." Worse, the connection between the pension obligation bonds and the newly fortified pension plan or health care trust fund will typically be forgotten. A false sense of reduced debt will then indirectly finance new spending. This continues the cycle of overpromising and underfunding benefit plans. For instance, the Bloomberg article goes on to describe how former Philadelphia Mayor Edward Rendell sold $1.29 billion in pension bonds in 1999. While trying to balance the city budget, Rendell's successor, John Street, did not make full contributions to the fund. As a result, Bloomberg reported, "The city has about 54 percent of the funds it needs to pay pension benefits over the next 30 years, about the same as in 1999 before it sold the bonds." Unfortunately, Michigan legislators may make a similar mistake. House Bills 4074, 4075 and 4077, which have already passed the Michigan House, and the recently introduced Senate Bill 927 would permit county and municipal governments to issue pension obligation bonds for their retiree health care costs. In fact, the bills would make it harder to reduce the benefits to something more reasonable. One can only hope that state and local policymakers will refrain from passing on this rashly incurred debt to future generations and instead modify government employees' pension and other retirement benefits to make their costs current, affordable and predictable. In the process, Michigan should reject pension obligation bonds. Indeed, such instruments should be outlawed altogether. Rick Dreyfuss, a business consultant and actuary, is a senior fellow with Harrisburg, Pa.-based Commonwealth Foundation and an adjunct scholar at the Mackinac Center for Public Policy, a research and educational institute headquartered in Midland, Mich. Permission to reprint in whole or in part is hereby granted, provided that the author and the Center are properly cited.